Winner of the Filaf d'argent 2014 (Festival International du Livre d'Art & du Film). Designed by Beat Keusch Visuelle Kommunikation, Basel – Beat Keusch, Angelina Köpplin. , born 1963 in Minneapolis, grew up in Binningen near Basel. He graduated in architecture from the Swiss Federal Institute of Technology, ETH Zurich, in 1990 and worked at Atelier Peter Zumthor 1990–94. In 1995 he established his own studio in Zürich. 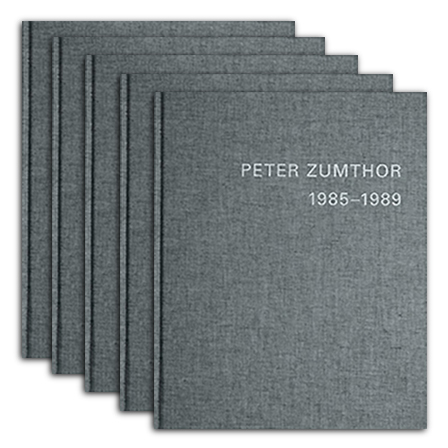 He has been curator of the exhibitions Peter Zumthor – Buildings and Projects 1986–2007 at Kunsthaus Bregenz (2007) and the LX Factory Lisbon (2008), and Architectural Models Peter Zumthor at Kunsthaus Bregenz (2012–2014).